For half a decade now, prolific Hong Kong director Johnnie To has been quietly establishing a lustrous reputation among Western cinephiles for his vigorous, dazzling works, which regard hoary crime thriller convention as a sandbox rather than a straightjacket. 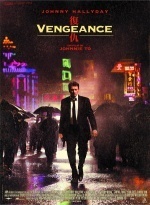 His latest feature, Vengeance, is a Hong Kong / French co-production filmed partly in English, and it proves to be the director's most unfussy film in years, a straightforward genre exercise pitched in To's peculiar key and seemingly formulated to lure fresh converts. The story is familiar: restaurateur and retired gangster Costello (weather-beaten French megastar Johnny Hallyday) searches Macau and Hong Kong for the killers who gunned down his daughter's family, recruiting a trio of Chinese hitmen as his local allies. Characteristically, it's the enthusiastic, slightly arch manner in which To presents familiar tropes that delights, as does his eye for memorable visuals: a landfill awash in shredded paper, a toy boomerang sailing silently through a picnic area, a flurry of girl scout stickers marking an execution target's trench coat. The film has its flaws, chiefly an unfortunate scene of mawkish drivel and a weakly conveyed plot device stolen from Memento. On balance, however, it's another fine illustration of To's enviable talent for transforming stale formulas into beguiling cinema.